Just returned from a trip to Spain. We spent two days in Granada and two in Malaga. We used the free ticket I won from Swiss International Airlines for my “Flowers in Your Horns” music video about going to San Francisco (I won one of the runner-up prizes). I wrote last week about Granada. We arrived from Granada in the mid-afternoon to a sunny and hot Malaga. We walked from the bus station to our hotel at the edge of the historic center of town. That was probably a mistake given the heat and because the area around the bus station is a huge construction site for the city’s new metro system. But we made it and the Hotel Posada del Patio was really great. Especially cool is that they incorporated the old Roman walls, found when excavating for the cellar, into the project: there are glass floors where you can look down at the old Roman construction and they hold events down there – we took a short tour. They, at least try, to speak your language! Malaga was supposed to be the low key part of our four day vacation to Spain so we did not plan any big sightseeing. After a siesta we walked around the historic center looking for a nice place to eat. We stopped at the Bodegas El Pimpi – which is recommended in many guidebooks – and it was fine. We sat at the bar, checked out the decor – alone worth the trip – and enjoyed beer, tomatoes and cheese, and olives. We were not so hungry so decided to go on walking around before dinner. Malaga’s historic center is full of narrow streets almost all of which have been turned into pedestrian zones. They were full of people walking around, shopping, eating and drinking … really nice urban feeling. Most of the streets are paved with smooth stone, often in patterns, and they are clean. It’s a nice feeling underfoot. 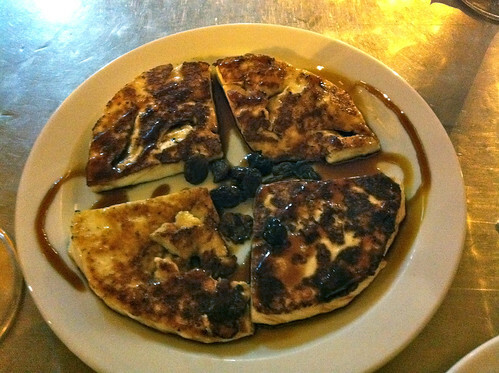 Eventually we found our way to Plaza Cervantes and found the El Tapeo de Cervantes, a recommended tapas bar. 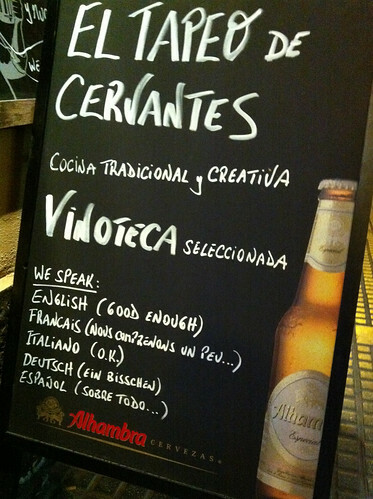 We found a place in the small bar and were greeted by a waiter who spoke probably five languages (see photo of sign). The atmosphere was fun and low key. We ordered five tapas to start and then a couple more as the night went on along with several glasses of the excellent local red wine. Since I love tapas this restaurant was a highlight of my visit. After dinner we walked back through the city. Of course the streets were full including a peaceful protest calling for political reform in the main square (there were similar protests going on all over Spain, including one in Granada) reminding me of the teach-ins of my youth. The restaurants and bars were overflowing into the pedestrian streets and it was a wonderful feeling. Since the city invented the Malaga flavour of ice cream we had some at Casa Mira, which according to my guidebook, is the oldest ice cream parlour in Malaga. It was quite good but the raisins were completely different tasting from typical raisins. 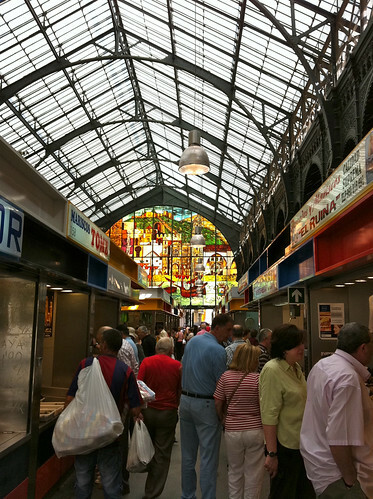 On Saturday morning we walked to the Atarazanas Market (Mercado Central de Atarazanas) and bought fresh papaya, salted almonds, bread, tomatoes, peaches and tasted lots of other things including Malaga raisins … then I realized why the raisins in the ice cream tasted the way they did! The Malaga raisins are completely different from the small rubbery pencil eraser raisins we used to eat in our grade school lunches. They are large, soft and juicy, yum! We stopped for breakfast at Cafe Aranda which specializes in Churros and coffee. 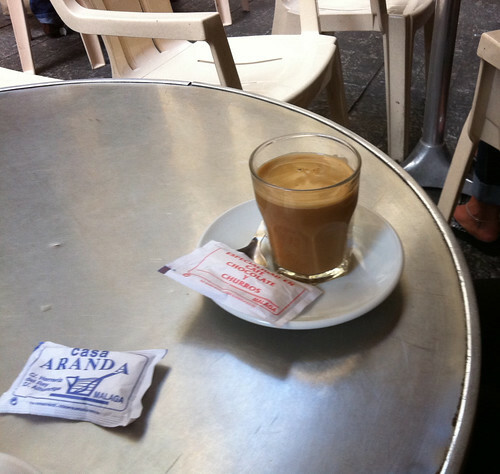 The cafe’s outdoor tables spread from Calle Alhondiga around the corner and along Calle Herreria del Rey for a whole block. The cafe also had several separate inside rooms along the streets. We didn’t sample the Churros but the person next to us asked if he could try one and they brought him a single Churros (usually they come in sets of 5! ), plus I don’t think that they charged him (he did leave a nice tip). Service was extremely friendly and the coffee was fine. On Saturday afternoon we walked to the beach. It took about a half hour with about 10-minutes being on the beach itself (we went to the far end). We had lunch of grilled fish in a nice restaurant on the beach. The waiter helped us pick-out a fish to share then they took it over to the open fire (built in a rowboat filled with sand) where it was grilled on a spit. 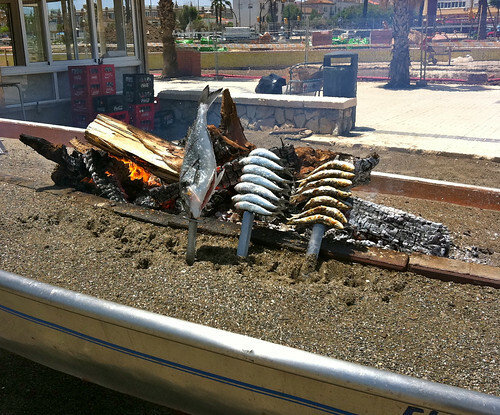 We also had an order of grilled sardines as we sipped our beer waiting for the larger fish. It was an excellent meal and again the service was very friendly. Christa went swimming and said the water was nice (the receptionist at the hotel told us it might be too cold to swim). After another siesta we went walking through the historic city looking for dinner again. 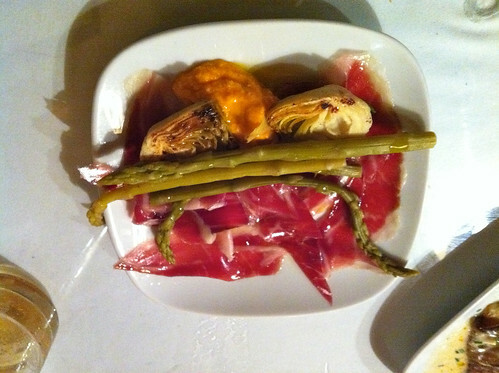 I fought my desire to return to El Tapeo del Cervantes and decided to be adventurous. We started with a beer on a very nice square on Carreteria street. Since the Champions League Final was on television no one was eating so we went to a couple bars before setting in one that seemed to have the most fans and watched the second half of the game. It was lots of fun because, of course, FC Barcelona won and the bar was full of fans singing and dancing. To celebrate FC Barcelona’s win we went to the tapas bar (?) called La Queseria (which means cheese market). Their specialty, naturally, is cheese, but they have other tapas too. We focused on the cheese ordering a mixed cheese plate for two and the fried cheese (I had to try that!). The mixed cheese was great and the fried cheese was fine, but it’s not really my taste. Instead of being deep fried (which I hate) it was sauteed and then served with a small amount of honey(? )-based jam. The meal went great with a couple glasses of the same local red wine we drank the night before. After walking around a little more we decided to stop in to a very nice looking tapas place near the hotel to enjoy the warm evening and busy streets. I had a glass of the sherry wine that we learned about having dinner with Francisco in Granada. We both agreed to come back again soon. what post would be complete without a train photo? The next morning we took the suburban train to the airport. 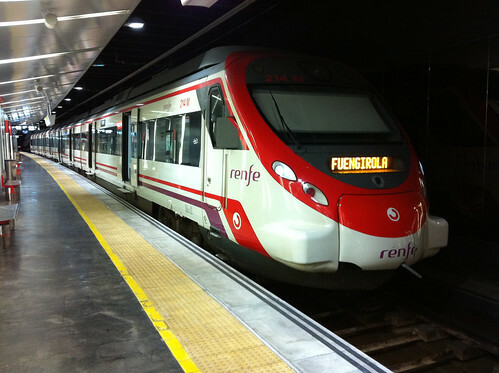 The station was about a 10-minute walk from our hotel and the trip was fast and convenient. 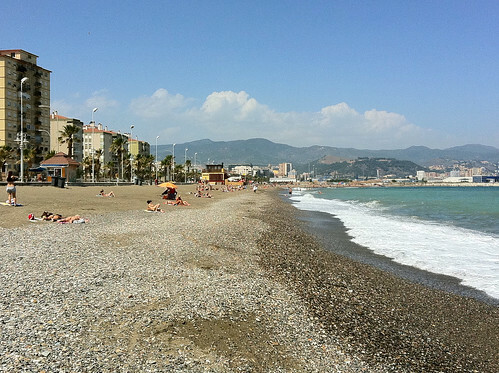 Here’s a link to my photos of Malaga on flickr.